The most important step! You need apples that are sweet - NOT something like Granny Smith's. Yeah, I know you like them (why do sweet women like sour apples???) and even if I did, they still wouldn't make good applesauce - you'd have to add a lot of sugar. You can pick your own, or buy them at the grocery store. But for large quantities, you'll find that real* farmer's markets, like the Farmer's Market in Forest Park, Georgia have them at the best prices. 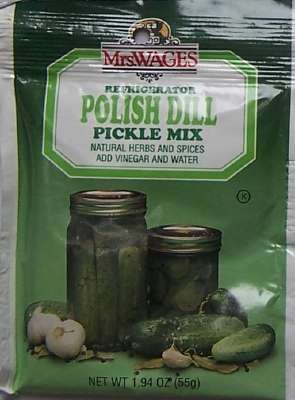 In 2004, they were available from late September at $11 to $16 per bushel. 2005 prices have been in the $14 to $20 range at the real farmer's markets, like the Atlanta-Forest park Georgia State Farmer's Market and orchards in the southeast of the U.S. 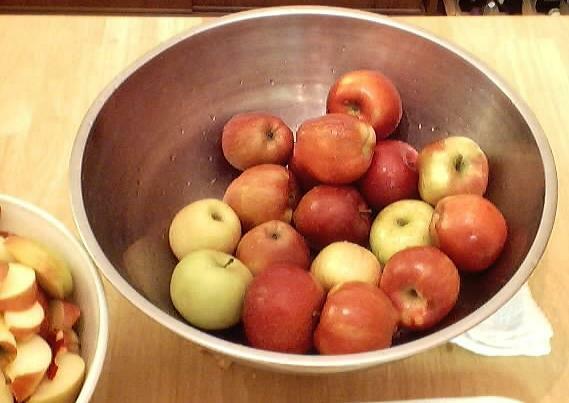 If you plan to later make applesauce, you'll get about 12 to 16 quarts of applesauce per bushel of apples. 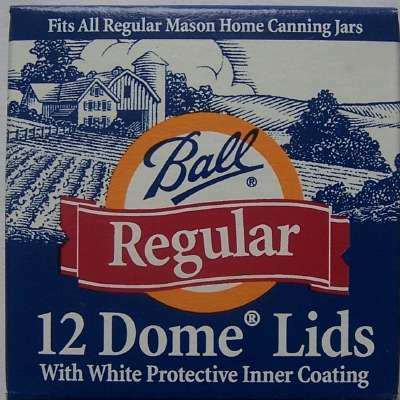 Count on 13 or 14 quarts per bushel. Step 3 -Wash the apples! You can freeze the apples in a syrup, sugar, or dry, depending upon how you intend to use them later. 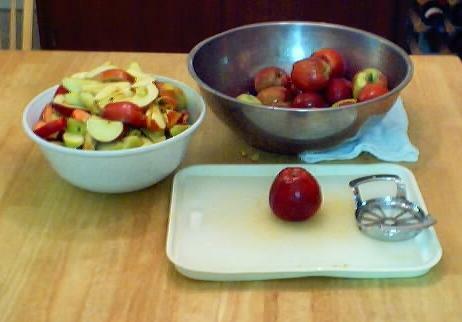 A Syrup Pack is preferred for apples to be used for uncooked desserts or fruit cocktail. A sugar or dry pack is good for pie making. The dry pack can be used any way. The sugar and syrup pack methods are less likely to brown or have freezer burn. Syrup Pack - Use cold 40 percent syrup. (That is 2 cups of sugar added to every 3 cups of water. ) Of course, you can scale this up or down to suit the amount of apples you have. To prevent browning, add 1/2 teaspoon (1500 mg) ascorbic acid (also known as "FruitFresh") to each quart of syrup. Sugar Pack - To prevent darkening, dissolve 1/2 teaspoon (1500 mg) ascorbic acid (also known as "FruitFresh") in 3 tablespoons water. 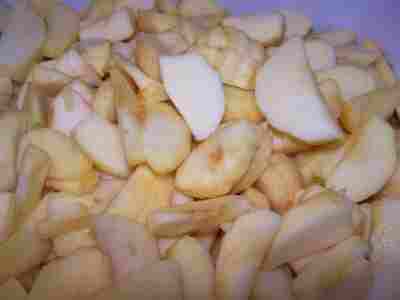 You will need 1/2 cup sugar per quart (1 1/4 pounds) of peeled, sliced apples. Dry Pack - To prevent darkening, dissolve 1/2 teaspoon (1500 mg) ascorbic acid (also known as "FruitFresh") in 3 tablespoons water. Step 7 - Mix the apples with the solution, sugar mix or FruitFresh. 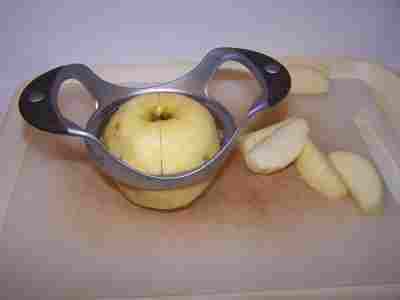 Use a bowl to mix apple slices with the syrup solution. If you are using a sugar pack or dry pack; use either a bowl or a large plastic bag (gallon size ZipLocs work well) to evenly coat the apple slices. Pack the slices into your freezer containers (freezer bags or plastic freezer containers... or glass (but due to risk of breakage, I tend not to use glass in the freezer). If you are using the dry pack approach, the treated apple slices can also be frozen first on a tray and then packed into containers as soon as they are frozen. That's it! They're done. If your freezer is good and cold (below 25 F) they should keep for many months. Try to avoid frost-free freezers, as they cycle briefly above freezing! Freezing keeps apples safe to eat almost indefinitely, but the recommended maximum storage time of 12 months is best for taste and quality. 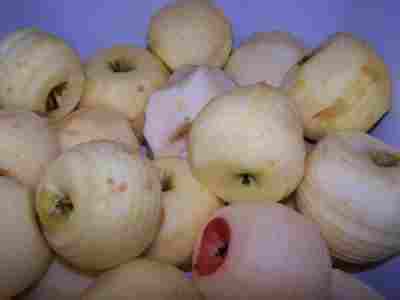 The quality of the frozen apples is maintained best in a very cold freezer (deep freezer), and one that keeps them frozen completely with no thaw cycles. Excluding any air from inside the bags which leads to freezer burn, by using vacuum-sealed bags, is also important to maintaining quality.